This 15-in-1 is a must for all commercial and industrial tradesmen. 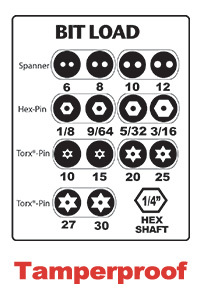 The Tamperproof assortment includes the most popular security bits, including Spanners, Hex Pins and Torx Pins. The shaft opening serves as a 1/4" hex driver!